As Tama was feeling too alone, later had a male companion called Ichigo. And this railway company decorated two of their trains in honour of these two cats. Also the station was remodelled to make it look like a cat from exterior. 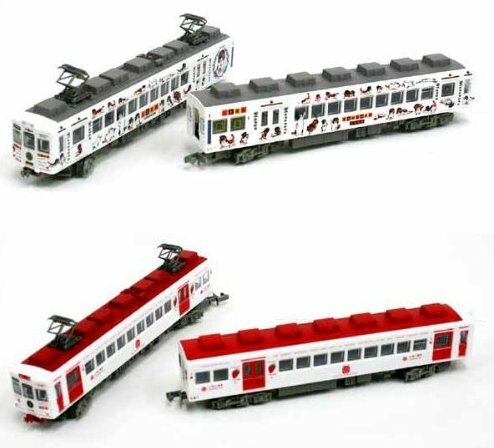 Tomytec did these two trains in their Tetsudou Collection (static models), and I bought them long before. But sadly two months ago Tama passed away, so I decided to motorize and digitalize it as my little remembrance. DCC conversion of the motorized unit is pretty easy. First un-clip the metal weight that covers the motor's current pick up strips, and cut them close to the motor. The plastic of the body is so thin that light is still too much strong and you can see it through. So when I have more patience I will open it again and change resistors for a stronger ones, minimum 1KOhm I guess. But meanwhile, the work is finished. Also the non motorized car needs more ballast, but that's also an improvement I put aside for now. My first idea was to install cab and tail lights, but I found it too much difficult (at least for my skills) in this model because of the body thinness. Light would be seen not only through the cab lights, probably the complete car would get illuminated.